The Packers are winning games with their defense for a change. It’s not surprising that the Green Bay Packers are 6-0, but the way they’ve played this season has been. Instead of overwhelming their opponents with a high-powered offense, the Packers are winning games with tough defense. 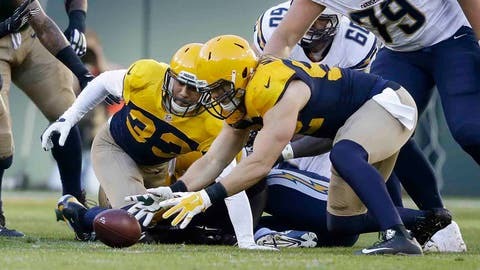 In a Week 6 showdown with the San Diego Chargers, the Packers had to preserve a 27-20 victory with a goal-line stand on the game’s final drive. Rookie cornerback Damarious Randall sealed the win when he dove to break up Philip Rivers’ fourth-down pass attempt to Danny Woodhead near the pylon. Packers linebacker Clay Matthews commented on how this year’s team is different from those of the past, via Bob McGinn of the Journal Sentinel. "These aren’t 42-0 blowout games like you saw in the second half of the season last year," Matthews said. "These have been gritty wins against good teams." Although Green Bay gave up more than 500 yards to the Chargers through the air, the Packers got the job done by keeping them out of the end zone. A stingy scoring defense has become a theme so far this season, as the Packers allow an average of 16.8 points per game, which is the NFL’s third best rate after the Jets (15.0) and Vikings (16.6).